Last night I was looking at my tomato plants, trying to figure out how many more tomatoes I might get before the first frost rolls through town. And I decided to prune those plants like never before. I want all possible energy to go into the fruit and not the greens at this point. It's crunch time! Well in getting my Edward Scissor Hands on, I found all of this! Several pounds of tomatoes that I didn't even realize were hiding in the very back of the plant jungle, against the brick wall. I had not even seen these when examining the plants over the weekend. They were buried so deep in the back behind all the green branches. Guess who is canning another batch of salsa tonight?! They look so good! I am sure your salsa will be as well :) Send me some. Ha. .....or some fried green tomatoes. 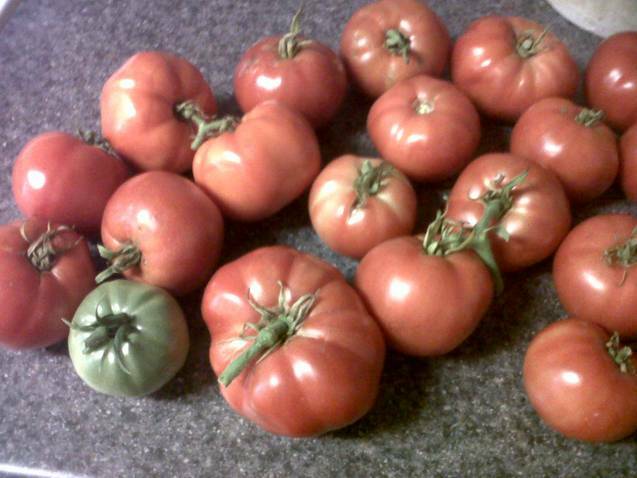 I'm so jealous of your tomato surge.....and homemade salsa, the best! Thankful for the farmers market but I miss my garden too!